I love lists and challenges. I like to set goals and make New Year's Resolutions. My two main goals this year are to be more creative and to get my house decluttered and in better order. 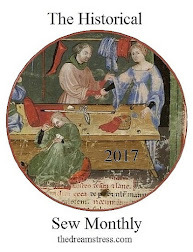 In order to force myself to be more creative, I have joined a number of monthly challenges including the Bead Journal Project and the Crazy Quilt Journal Project. I also decided to join Debbie's Ultimate Crazy January February Challenge. This started out a number of years ago as a blog challenge to start fifteen new stitching projects on each of the first fifteen days of the year. The challenge expanded over time and moved to Facebook. The original Debbie died suddenly and the challenge continues in her memory. I am using the challenge to force me to go through my cross stitch stash and identify those projects that I will actually work on and complete and start them. I plan to sell or give away projects that I will never work on. I have decided to start 31 new projects in January 2016 and to pull out 29 Works in Progress in February 2016. The new projects are all different sizes and are listed in the side bar. On January 1, I worked on Heart'n Hand by Jan Stephens Rogers of With Humble Heart Needleart. I originally thought that this piece was solidly stitched, but it is not, the background is a hand dyed teal linen and only the design is stitched, not the background. I am also challenging myself to walk every day. On January 1, I visited the Chicago Botanic Garden and enjoyed their walking paths. The paths were liberally coated with sand and it was not windy so the walk was fairly pleasant. I encountered several couples who were looking for directions and a number of other walkers, but there were more geese and squirrels out than people. Remnants of the recent snow storms were easy to find and added a zen-like quality to the winter landscape.